This class holds information on surfaces, emitters and participating media and coordinates rendering jobs. It also provides useful query routines that are mostly used by the Integrator implementations. Construct a new, empty scene. Create a shallow clone of a scene. Unserialize a scene from a binary data stream. Add a child node to the scene. Add a sensor to the scene's sensor list. Return an axis-aligned bounding box containing the whole scene. Cancel a running rendering job. This function can be called asynchronously, e.g. from a GUI. In this case, render() will quit with a return value of false. Return the environment radiance for a ray that did not intersect any of the scene objects. This method additionally considers transmittance by participating media. This is primarily meant for path tracing-style integrators. Return the environment radiance for a ray that did not intersect any of the scene objects. Return the transmittance between p1 and p2 at the specified time. The implementation correctly handles arbitrary amounts of index-matched medium transitions. The interactions parameter can be used to specify a maximum number of possible surface interactions and medium transitions between p1 and p2. When this number is exceeded, the function returns zero. Note that index-mismatched boundaries (i.e. a transition from air to water) are not supported by this function. The integrator needs to take care of these in some other way. p2OnSurface Is the target position located on a surface? interactions Specifies the maximum permissible number of index-matched medium transitions or BSDF::ENull scattering events on the way to the light source. (interactions<0 means arbitrarily many). When the function returns a nonzero result, this parameter will additionally be used to return the actual number of intermediate interactions. sampler Optional: A sample generator. This may be used to compute a random unbiased estimate of the transmission. An spectral-valued transmittance value with components between zero and one. Return the transmittance between p1 and p2 at the specified time (and acount for "special" primitives). This function does exactly the same thing as evalTransmittance, except that it additionally performs intersections against a list of "special" shapes that are intentionally kept outside of the main scene kd-tree (e.g. because they are not static and might change from rendering to rendering). This is needed by some bidirectional techniques that care about intersections with the sensor aperture, etc. Return the block resolution used to split images into parallel workloads. Return a bounding sphere containing the whole scene. Return the render output filename. Return the scene's kd-tree accelerator. Return the scene's participating media. Note that when rendering using multiple different threads, each thread will be passed a shallow copy of the scene, which has a different sampler instance. This helps to avoid locking/contention issues and ensures that different threads render with different random number sequences. The sampler instance provided here is a clone of the original sampler specified in the sensor. Return the list of sensors that are specified by the scene. As scene can have multiple sensors – however, during a rendering, there will always be one "main" sensor that is currently active. Return the name of the file containing the original description of this scene. Return a set of special shapes related to emitter/sensor geometry in bidirectional renderings. Return the a list of all subsurface integrators. Note that this function only cares about the spatial component of the emitters – its value does not depend on whether the directional emission profile is degenerate. Note that this function only cares about the spatial component of the sensor – its value does not depend on whether the directional response function is degenerate. Does the scene have a environment emitter? Does the scene contain participating media? This function must be called before using any of the methods in this class. Initialize the scene for bidirectional rendering algorithms. This ensures that certain "special" shapes (such as the aperture of the sensor) are added to the scene. This function should be called before using any of the methods in this class. This function must be called if, after running initialize(), additional geometry is added to the scene. Evaluate the probability density of the direct sampling method implemented by the sampleEmitterDirect() method. Evaluate the spatial component of the sampling density implemented by the sampleEmitterPosition() method. Evaluate the probability density of the direct sampling method implemented by the sampleSensorDirect() method. Evaluate the spatial component of the sampling density implemented by the sampleSensorPosition() method. Perform any post-processing steps after rendering. Progress is tracked by sending status messages to a provided render queue (the parameter job is required to discern multiple render jobs occurring in parallel). The last three parameters are resource IDs of the associated scene, sensor and sample generator, which have been made available to all local and remote workers. Perform any pre-processing steps before rendering. This function should be called after initialize() and before rendering the scene. It might do a variety of things, such as constructing photon maps or executing distributed overture passes. Intersect a ray against all primitives stored in the scene and return detailed intersection information. Intersect a ray against all primitives stored in the scene and return the traveled distance and intersected shape. This function represents a performance improvement when the intersected shape must be known, but there is no need for a detailed intersection record. Intersect a ray against all primitives stored in the scene and only determine whether or not there is an intersection. This is by far the fastest ray tracing method. This performance improvement comes with a major limitation though: this function cannot provide any additional information about the detected intersection (not even its position). Intersect a ray against all scene primitives and "special" primitives, such as the aperture of a sensor. This function does exactly the same thing as rayIntersect, except that it additionally performs intersections against a list of "special" shapes that are intentionally kept outside of the main scene kd-tree (e.g. because they are not static and might change from rendering to rendering). This is needed by some bidirectional techniques that e.g. care about intersections with the sensor aperture. Intersect a ray against all normal and "special" primitives and only return the traveled distance and intersected shape. Intersect a ray against all normal and "special" primitives and only determine whether or not there is an intersection. Remove a sensor from the scene's sensor list. Render the scene as seen by the scene's main sensor. Given an arbitrary reference point in the scene, this method samples a position on an emitter that has a nonzero contribution towards that point. In comparison to sampleEmitterDirect, this version also accounts for attenuation by participating media and should be used when dRec.p lies inside a medium, i.e. not on a surface! Ideally, the implementation should importance sample the product of the emission profile and the geometry term between the reference point and the position on the emitter. medium The medium located at the reference point (or NULL for vacuum). sampler Optional: a pointer to a sample generator. Some particular implementations can do a better job at sampling when they have access to additional random numbers. An importance weight given by the radiance received along the sampled ray divided by the sample probability. Given an arbitrary reference point in the scene, this method samples a position on an emitter that has a nonzero contribution towards that point. In comparison to sampleEmitterDirect, this version also accounts for attenuation by participating media and should be used when the target position lies on a surface. its An intersection record associated with the reference point in dRec. This record is needed to determine the participating medium between the emitter sample and the reference point when its marks a medium transition. medium The medium located at its (or NULL for vacuum). When the shape associated with its marks a medium transition, it does not matter which of the two media is specified. Given an arbitrary reference point in the scene, this method samples a position on an sensor that has a nonzero response towards that point. In comparison to sampleSensorDirect, this version also accounts for attenuation by participating media and should be used when dRec.p lies inside a medium, i.e. not on a surface! This function can be interpreted as a generalization of a direct illumination sampling strategy to sensors. Ideally, the implementation should importance sample the product of the response profile and the geometry term between the reference point and the position on the sensor. Given an arbitrary reference point in the scene, this method samples a position on an sensor that has a nonzero response towards that point. In comparison to sampleSensorDirect, this version also accounts for attenuation by participating media and should be used when the target position lies on a surface. Ideally, the implementation should importance sample the product of the emission profile and the geometry term between the reference point and the position on the sensor. its An intersection record associated with the reference point in dRec. This record is needed to determine the participating medium between the sensor sample and the reference point when its marks a medium transition. Given an arbitrary reference point in the scene, this method samples a position on an emitter that has a nonzero contribution towards that point. testVisibility When set to true, a shadow ray will be cast to ensure that the sampled emitter position and the reference point are mutually visible. Sample a position according to the emission profile defined by the emitters in the scene. To sample the directional component, please use the Emitter::sampleDirection() method. An importance weight associated with the sampled position. This accounts for the difference in the spatial part of the emission profile and the density function. Importance sample a ray according to the emission profile defined by the sensors in the scene. Note that this function potentially uses a different sampling strategy compared to the sequence of running sampleEmitterPosition() and Emitter::sampleDirection(). The reason for this is that it may be possible to switch to a better technique when sampling both position and direction at the same time. Given an arbitrary reference point in the scene, this method samples a position on an sensor that has a nonzero contribution towards that point. This function can be interpreted as a generalization of a direct illumination sampling strategy to sensors. Ideally, the implementation should importance sample the product of the response profile and the geometry term between the reference point and the position on the emitter. testVisibility When set to true, a shadow ray will be cast to ensure that the sampled sensor position and the reference point are mutually visible. An importance weight given by the importance emitted along the sampled ray divided by the sample probability. Sample a position on the main sensor of the scene. This function is provided here mainly for symmetry with respect to sampleEmitterPosition(). To sample the directional component, please use the Sensor::sampleDirection() method. extra An additional 2D vector provided to the sampling routine – its use is implementation-dependent. An importance weight associated with the sampled position. This accounts for the difference in the spatial part of the response profile and the density function. 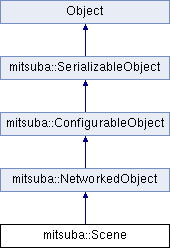 Serialize the whole scene to a network/file stream. Set the block resolution used to split images into parallel workloads. Set the render output filename. Note that the integrator is not included when this Scene instance is serialized – the integrator field will be NULL after unserialization. This is intentional so that the integrator can be changed without having to re-transmit the whole scene. Hence, the integrator needs to be submitted separately and re-attached on the remote side using setIntegrator(). Note that the sampler is not included when this Scene instance is serialized – the sampler field will be NULL after unserialization. This is intentional so that the sampler can be changed without having to re-transmit the whole scene. Hence, the sampler needs to be submitted separately and re-attached on the remote side using setSampler(). Set the main scene sensor. Note that the main sensor is not included when this Scene instance is serialized – the sensor field will be NULL after unserialization. This is intentional so that the sensor can be changed without having to re-transmit the whole scene. Hence, it needs to be submitted separately and re-attached on the remote side using setSensor(). Set the name of the file containing the original description of this scene.